This Jim Hoy quote is included in an exhibit at the Flint Hills Discovery Center in southern Manhattan, Kansas, and I couldn’t have expressed it better myself. The subtle beauty and the quietness of the space in the Flint Hills can be difficult to describe. Having gone to school in Manhattan, coming back to the town to research the bike trails by the river, I figured that I knew all the city had to offer. 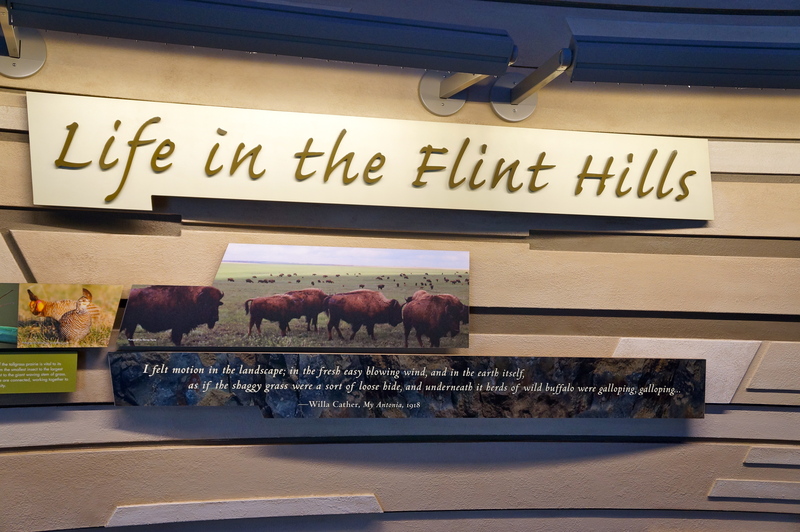 But the Flint Hills Discovery Center opened in April 2012, and it’s a great place to go and get lost in the history and lure of the Flint Hills for an hour or two, especially for those with kids or who have any interest in Kansas, history, geography, biology, or ecology. What’s special about the Flint Hills? Once 250 million acres stretching from Canada to Texas, the tallgrass prairie is now 95% gone – plowed under and turned into farmland. Thanks to the rocky soil, mostly limestone, in the Flint Hills area, the prairie here was saved. This rare and delicately balanced ecosystem is home to all kinds of flora and fauna from grasshoppers to bison and snakes to butterflies. Looking through the first floor exhibits at the Flint Hills Discovery Center, you see the prairie from all angles: formation of the rock layers and the rolling hills over thousands and millions of years, the plants and wildlife that make the prairie what it is – including beneath the soil’s surface, the importance of fire to keeping the prairie healthy, history and culture of the Native Americans who called the prairie home or hunting ground and were then relocated with the European influx, the cowboys and ranchers who have driven cattle to and from the grassland for grazing. What stands out is the mix of exhibits like the rolling video of interviews with people of the Flint Hills and the interactive activities. While appealing for kids, they’re also interesting/entertaining for adults – like the Auctioneer’s Karaoke (I couldn’t keep up!). You can also see how you’d do keeping a section of prairie healthy with a touch screen simulation – balancing the amount of cattle or bison with the number of burns over a 7-year time span with a luck-of-the-draw amount of rain. My first try ended poorly with my bison hungry and with non-native, invasive species encroaching on the prairie. Whoops! I tried it again with better results. I’ll let you see how you do! Also on the first floor is the auditorium for the multi-media “immersive” program: “Tallgrass Prairie: Tides of Time.” The 15-minute presentation takes you to the prairie throughout its seasons, including blowing wind and falling snow. I’ve never been in a museum presentation quite like it, and I’m sure that it’s a hit with kids who might find other “educational” presentations boring. It’s also got some pretty great cinematography and photography that really show off the prairie at its most beautiful and dynamic. While much of the downstairs area is kid-friendly, upstairs is primarily the kid’s area, and, bonus, it’s actually ideal for kids of all ages. A lot of museums or centers like this one include activity zones that are better for older kids and leave nothing for younger ones. This has a 30lb and under section where kids can crawl and explore. Then there’s a dress-up area, a reading spot, a “prairie pipe organ” and even a slide. Also upstairs is the temporary exhibit space. 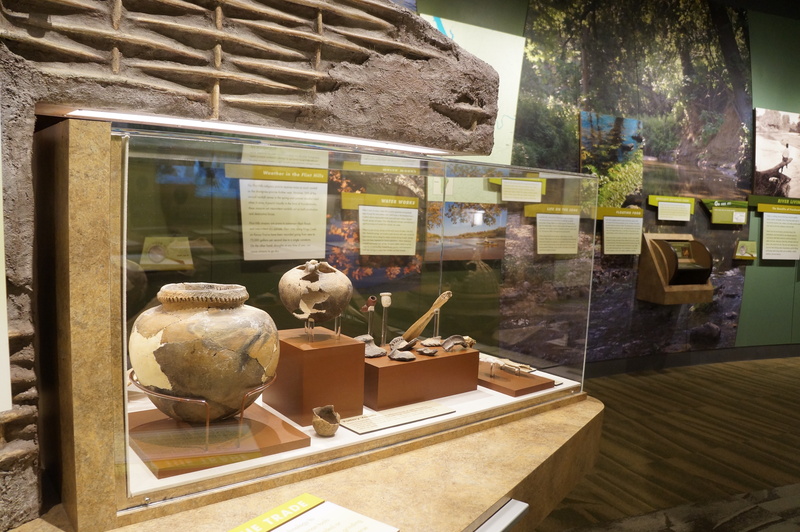 Until September 8, 2013, the exhibit is Conservation Quest. All about how to save energy, it also has plenty of interactive stations. 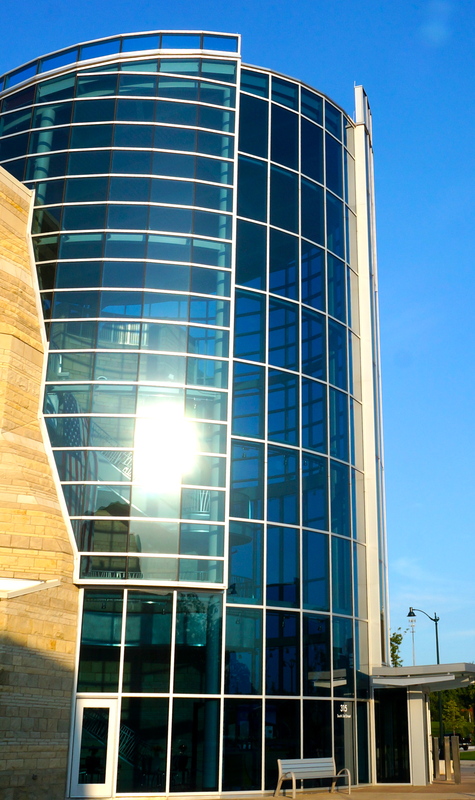 The building itself is energy efficient and sustainably designed. To commemorate your visit, there’s a little gift shop with many items made in/from Kansas with a mix of books, jewelry, candles, and toys. I was lucky to be staying in the Fairfield Inn, which is right next door; otherwise, since I hadn’t heard about this spot before, I might have missed out. Don’t risk making that mistake! Monday through Thursday: 10 a.m. – 8 p.m.
Monday through Wednesday: 10 a.m. – 5 p.m. This entry was posted in Family Friendly, Off the trail and tagged Family Friendly, Flint Hills, Flint Hills Discovery Center, Kansas, kansas tourism, Manhattan, museum, Tallgrass prairie. Bookmark the permalink.